‘’Biriyani” – this just not represent the name of the food, but its taste of Indian food as well. I guess, there are hardly any people who have travelled India, and might not have tasted ‘Biriyani”. It will simply sound awful to hear that somebody have not tasted even though they have been to India. It’s not because they are stupid, but because, they want to sound stupid. This statement represents that how famous it is in India and for the people who have its taste got hanged on their tongue for ever once they taste it. After almost 4 years or so, I got the chance to sense it once again, but this time in completely new place. It’s a taste away from the main-land. 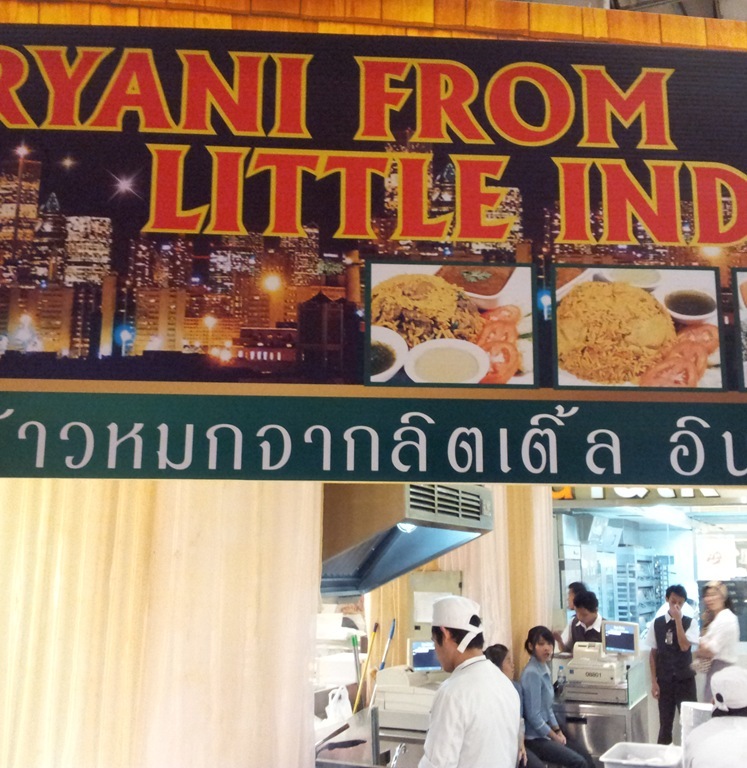 For some reason I have been to downtown and I was roaming and strutting and finding nothing in specific when I find this ‘Little India’ restaurant in the Food Court. At first, I faltered to order it as I could see people cooking were not the native Indians but the local Thai chefs. But, thinking of possibility and taking small challenge, I thought of trying in apprehension, which turns out to be beyond my expectation. But, I believe this might be just for me. So, this is a personal interpretation of the experience. So, before believing my post, you should better go there and taste it by yourself. I find it so delicious that I thought of sharing this to you guys. May be someday you will come to this place and want to try something different – you could give it a try here. Though there are hundreds of restaurants all over Bangkok which is virtually impossible to mention and it is not even ethical in terms of the taste comparison. Since the food in South Asian countries are almost similar with a little difference which covers almost all array of countries like: Nepal, India, Pakistan, Afghanistan, Bhutan, Sri Lanka, Bangladesh and others. But, again, this doesn’t strongly represents all foods in these countries are same – but some what similar. Even within a country we have different varieties and tastes of food, but in totality it can be said that it is not as completely alien as the food from the Western countries and the Eastern countries. So, you can probably guess, what I really mean when I say similar kind of taste! Wish you too will have some similar kind of experience. And, please, do not forget to input some comment about your experience if you have ever visited this place. If you want to find this place, you can go straight to SIAM PARAGON, step down to FOOD COURT and ask anyone there with its name – they will show you the exact place. But, if you are a eagle-eyed, I hope you will not even have to work that hard!